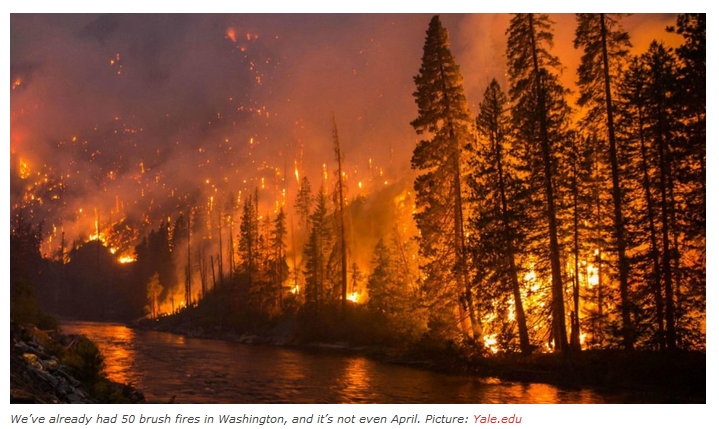 We are not even into April, but we’ve had 50 brush fires across Washington just this week. Firefighters usually start getting busy fighting brush fires and wildfires starting in June, so the fact that we’ve seen so many fires so far is significant. Western Washington was showing off on Thursday. It’s beautiful and sunny out. Pleasant as it is, the unseasonably warm conditions are drying out our vegetation very quickly. “It’s very unusual for our region to see that many wildfires,” Q13 News Meteorologist Tim Joyce said. Joyce says all the snow in February was still not enough to build a solid snowpack.“Even though we saw a ton of snow we didn’t see a huge wet winter. The winter was pretty dry in December and abnormally dry in January,” Joyce said. Out of the 50 brush fires, 49 of them have been West of the Cascades. “For us, incredibly strange,” Joyce said. For example, just this week alone, a brush fire in Spanaway burned one building and threatened several more. In Eatonville, firefighters had to contain a 45-acre brush fire. Then on Wednesday, a fire displaced more than a dozen people at a White Center apartment complex. “It was like a really loud explosion you heard a big boom and after you heard that my whole living room shook a little,” White Center resident Charles Batts said. Be prepared and protect your homes!